We also find that pioneer businesses may enhance gentrification through a signalling effect. Their presence provides information on a neighbourhood’s prospects for potential investors and other businesses, and signal that the neighbourhood will improve in the future. 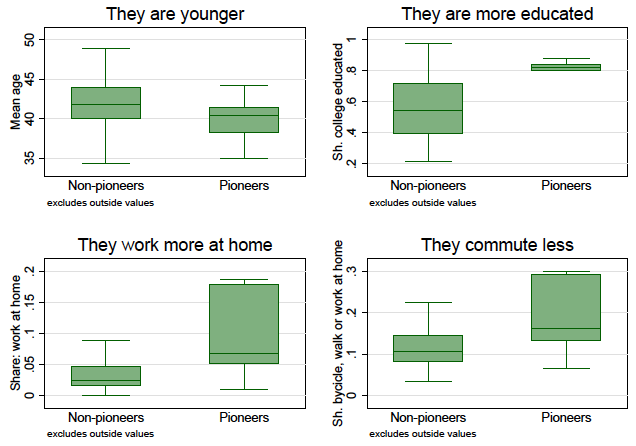 Last, we show that pioneer businesses are not intrinsically valued as amenities by local residents – their presence does not seem to be a direct attractor of wealthy and educated people. However, we do show that their presence in a block is associated with the future arrival of several consumption amenities, including restaurants and bars. Pioneers may thus indirectly contribute to the influx of young and educated residents, through the rise in consumption amenities that follows their arrival in the neighbourhood. Autor, D H, C J Palmer, and P A Pathak (2017), “Gentrification and the Amenity Value of Crime Reductions: Evidence from Rent Deregulation”, NBER Working Paper 23914. Behrens, K, B Boualam, J Martin and F Mayneris (2018), “Gentrification and pioneer businesses”, CEPR Discussion Paper 13296. Cohen, N. (2018), “Feeding or starving gentrification: the role of food policy”, CUNY Urban Food Policy Institute Policy Brief 05/2017. Hwang, J and J Lin (2016), “What have we learned on the recent causes of gentrification?”, Cityscape: A Journal of Policy Development and Research 18(3): 9–26. Ley, D (2003), “Artists, Aestheticisation and the Field of Gentrification”, Urban Studies 40(12): 2527–2544. OECD (2018), “Opportunities for all: OECD Framework for Policy Action on Inclusive Growth”, Policy Brief. More precisely, we require that a block gains at least three deciles in terms of income per capita and one decile in terms of college-educated residents to be considered as gentrifying. Our analysis is not sensitive to slight deviations from this definition.